The next time you are at a basketball game, and a player launches a long shot from the backcourt, you might muse aloud "Ah, Einstein was correct, spacetime IS curved." If the fan next to you questions your judgement (or sanity), you can reply ... "See the arc of the ball, it is following the curvature of spacetime, just as described in Einstein's general theory of relativity", and, you would be exactly right. The photo shows Kareem Abdul Jabbar preparing to demonstrate Einstein's general theory. We'll calculate the radius of curvature of Kareem's sky hook in spacetime below, and the answer may surprise you. Minkowski Spacetime, The Equations of Weingarten, Christoffel Symbols of the First and Second Kind, the Ricci Tensor, the Theorema Egregium, the Riemann Curvature Tensor, and more! Where special relativity didn't require any calculus, general relativity is a smorgasbord of differential equations. General relativity is primarily a theory of why things fall, it replaces Newton's theory of gravity. According to the general theory as proposed by Einstein, the apple falls from the tree not because of some mysterious invisible force called gravity, but because the spacetime around the apple is curved by the large mass of the earth. How can we 'visualize' the new theory? ... actually, we don't have to visualize it as we can actually see it with our own two eyes. Remember, when Kareem releases his sky hook, there is no gravity pulling it down. So, why does it fall? Because spacetime is curved, and the ball is actually following a geodesic, or straight line, in curved spacetime. The arc of the ball's trajectory is due to the curvature of spacetime ..... there it is. The mathematics of general relativity is the mathematics of non-Euclidean curved space, and, remarkably, the mathematics was invented before the advent of relativity, the mathematics of curved space was initiated by Gauss and further developed by his student, Riemann. Gauss was studying the problem of drawing a flat map of the earth, he discovered that a perfect distance preserving flat map couldn't be drawn because the earth is a curved surface. Note that a distance preserving flat map of a cylindrical surface can be drawn by unrolling the cylinder, thus, a cylinder is not a curved surface! Riemann added to the theory of curved surfaces and this branch of mathematics is called Riemannian geometry; there is no avoiding it if we are going to understand general relativity. If what follows seems a little complex, be consoled to know that it is only 'elementary' Riemannian geometry. And, really, it's mostly just differentiating local basis vectors, expressing the result in the local frame, and giving names to the vector components. I.e., it mostly straightforward differentiation, combined with rearranging the terms and naming new functions. Much of the apparent compexity comes from the sheer number of functions, even for a two-dimensional curved surface this proliferation can be daunting. Note that every one-dimensional curve has a straight line distance preserving map, and so we can't simplify matters further by reducing the dimension to one as there are no one-dimensional curved spaces. the curve a(s) = (R*sin(s/R), R*cos(s/R), 0) is a circle in the x-y plane with radius R. It is parameterized by arc length. Thus, the curvature of a circle of radius R is 1/R. Seems right. 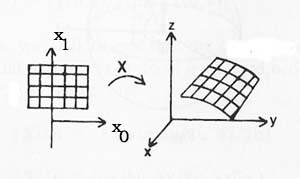 Then, the velocity vector of any curve at a point in the surface is a linear combination of X0 and X1, so, these vectors span a vector space, called the tangent vector space, at every point on the surface. We like for basis vectors to be orthogonal unit vectors, but, X0 and X1 may not be, so we define the symbols gij by gij = Xi · Xj , gij are the elements in a 2x2 matrix of 'metric coefficients' denoted by [g]. The importance of the metric coefficients is twofold, they can be computed by an inhabitant of the curved space, and they can be used to compute the curvature of the space, as we shall see. In Gauss's words - "These investigations deeply affect many other things, and I would go so far as to say that they are involved in the metaphysics of the geometry of space." Since U · U = 1, the partial derivatives of U, denoted by Ui, are in the tangent plane and can be written, defining the functions Lij, as Ui = L0iX0 + L1iX1. These are the equations of Weingarten. The Rhijk are the components of the Riemann curvature tensor. Note that the Riemann curvature tensor is defined in terms of the Christoffel symbols, which are functions of the metric coefficients. 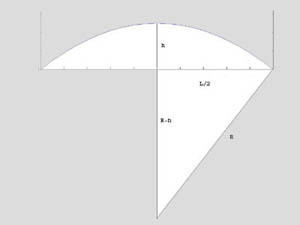 The Lij and Lij are functions of how the normal vector U changes, i.e., the curvature of the surface. Gauss defined the curvature of a 2-d surface geometrically, and showed that it equals det([L])/det([g]). The Riemann curvature tensor allows the curvature to be computed from values that can be calculated in the surface, the gij. It provides the building blocks for the left side of Einstein's field equations. The Rij are the components of the Ricci tensor. A few weeks after Einstein published the general theory in 1915, he received a letter from Karl Schwarzchild , a German astrophysicist, who was fighting on the Russian front. The letter contained a solution to the field equations for a single point mass located in empty space. This solution is now known as the Schwarzchild solution. We can simplify it by considering a space of only 1 dimension, and the resulting spacetime with 2 dimensions. and R01 and R10 are identically 0, and R11 is equivalent to the 1st. and this is similar to the Newtonian result. 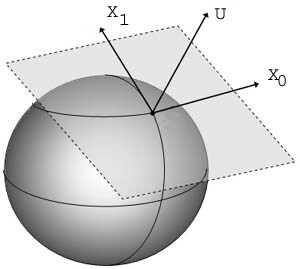 Note that the downward acceleration of the ball does not depend on the ball's position, in contrast to gravity as we know it where the acceleration increases as the ball falls due to the increasing strength of gravity. The reason is the following: in 3-d, as the distance from a mass increases the gravitational force decreases in such a way that when integrated over a ball of radius r, the result is a constant. Thus, the force decreases proportional to 1/r2. In a 2-d world the gravitational force decreases proportional to 1/r. In a 1-d world it doesn't decrease.